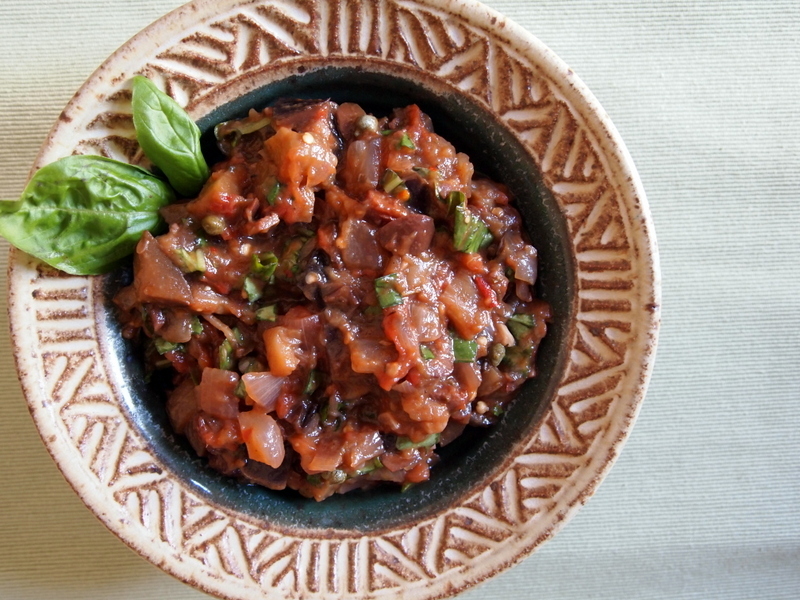 For me, eggplant caponata brings to mind fond memories of my grandmother’s caponata made from eggplants and tomatoes she and my grandfather grew on their small farm in Maryland. My version is a little more full-flavored than my grandmother’s, but it still has that rich, warm quality I remember. I like to put a lot of extra “stuff” in my caponata, like raisins, capers, and olives, so that each bite has a few hidden treasures, all bound together by the sweet and savory base of eggplant and tomatoes. First we need to peel the tomatoes. Bring a large pot of water to a rolling boil. While the water is coming to a boil, make an X-shaped score on the bottom of each tomato and cut out the core of each tomato from the top. Carefully place the tomatoes in the water. Bring the water back to a boil and leave the tomatoes in for 5 minutes. The skin should appear loose. Plunge the tomatoes into an ice water bath for about 2 minutes. The skins should come right off! Dice the peeled tomatoes, reserving as much of the juice that comes out during chopping as possible. In a large pot, saute the onion and garlic in the olive oil over medium high heat until the onions are translucent, about 3 minutes. Add the eggplant, lower the heat to medium, and cook for about 10 minutes, stirring frequently. The eggplant should reduce drastically in size and be very soft and brown at the end of the 10 minutes. Add the diced tomatoes and reserved juice, vinegar, raisins, olives, capers, thyme, oregano, 2 dashes of cinnamon, and red pepper flakes. Continue cooking over medium heat for 10 to 15 minutes until most of the liquid has been absorbed or evaporated. Remove from heat and stir in the fresh basil. Season to taste with salt and pepper. Let cool to room temperature or refrigerate before serving. This caponata is great as a side dish, on top of toasted crostini, or as a main course. how many tomatoes do you use? I don’t see tomatoes in the ingredient list. Whoops, thanks for the catch! I’ve amended the recipe to include the forgotten tomatoes (1.5 pounds). Looks great! I think I’ll have to give this a try.